NATO former deputy secretary-general Alexander Vershbow said that Russia wishes to demonstrate its capability to successfully become involved in a full-scale war with NATO. "The recent Zapad joint military exercises conducted by Russia and Belarus showed that Moscow, which itself is very afraid of Western values and is thus countering them, wishes to demonstrate its capability to successfully become involved in a full-scale war with NATO", NATO former deputy secretary-general Alexander Vershbow said. "The alliance must come to the necessary conclusions and strengthen its deterrence capabilities, but it cannot exaggerate its reaction, so that Russia’s attempts to intimidate and making the West believe that it is much stronger than it actually is come to fruit. NATO is certainly much more powerful than Russia, Vershbow added, in an interview with Latvian News Agency LETA and Defence Matters. People in the Baltic states were seriously concerned about possible “provocations” during the Russian/Belarussian joint military exercises Zapad-2017. Was there an actual basis for these fears? Well, I don’t think we had to be afraid of Zapad, although there were some scenarios, such as leaving troops permanently in Belarus. I think a lot of the publicity and calls for more transparency may have discouraged Russians from even considering some of those scenarios. But we will never know. Although a full analysis is still to come, but I think that we saw in Zapad 2017 continued advances in the development of the Russian armed forces and Russian strategy compared to Zapad 2013. In addition to being able to mobilise large numbers of forces, they showed a much greater capacity to use those forces in very specific ways including demonstrating A2/AD to confound or obstruct the ability of an adversary to bring in reinforcements. We saw much more proficient joint operations among the different services. Of course, the bottom-line is, and we saw it again, that the Russians pretended they are fighting terrorism but in fact they used these exercises to demonstrate the capacity to fight and win a full-scale war with NATO. We must draw some conclusions from this, and perhaps we should enlarge the exercises of our own to develop our own capabilities to counter this A2/A2 capability. We also must continue pressuring the Russians to be more transparent. Clearly there were more than 12,700 troops involved in Zapad, we have to try to hold the Russians to the letter of Vienna document and another agreements. If such large exercises continue along our Eastern borders, shouldn’t we reconsider the amount of NATO troops stationed here? I think the battalions we have deployed in the three Baltic states and Poland provide the deterrent against provocations even if the numbers are relatively small. 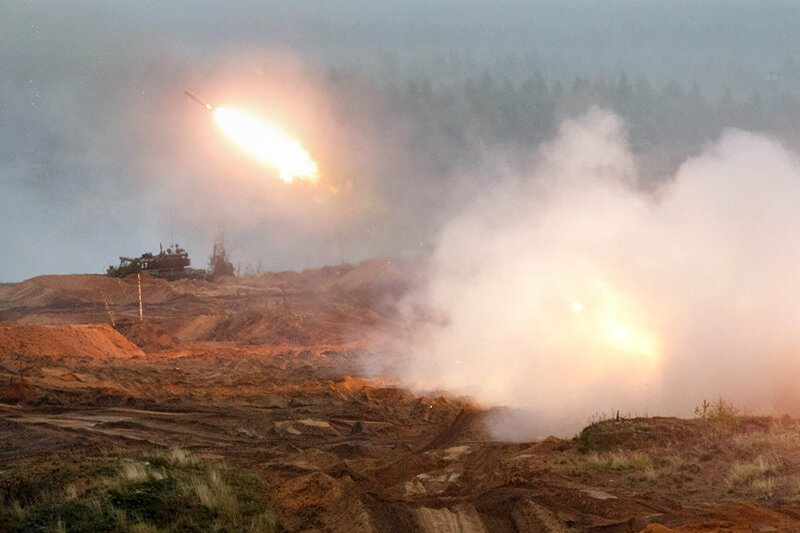 It would be clear to Russia in any scenario that they are engaging in the conflict with all of NATO, and not only with Latvian or Estonian defense forces. But the strategy NATO has adapted depends heavily on reinforcement. If there is a crisis, and we see the kind of forces that we saw in Zapad being mobilized, then we would have to activate some of these reinforcements and get them moving from their locations whether they are in the Western part of Europe or from the United States. And we must exercise the capacity to do so, to show the Russians we mean business. So, I come back to the idea that NATO exercises, even though they have already been expanded considerably, also need to demonstrate our capacity to carry out a whole strategy, including large scale reinforcement. Can we see such Russian exercises as the next step to win peoples’ minds, as a part of the propaganda and information war? I think that all the focus on disinformation, fake news and propaganda is beginning to educate people, to make them more vigilant and more suspicious about the sources of the information. Because the exercises are a different kind of information, where they are trying to intimidate, they want us to fear Russia, to show that Russia is perhaps even more powerful than it really is, to demoralize, to divide the alliance, maybe even to encourage the lifting of sanctions without any resolution of the crisis in Ukraine. We have to be honest with ourselves about what the Russians are doing. We must not be intimidated and take the necessary steps to strengthen our deterrence. But also, we must not overreact, and not give the Russians the satisfaction of appearing to be afraid when we ultimately are the stronger party, we have more military capability, our countries are much richer than Russia and we have democratic values on our side. I think, if you look at the big picture, it is Russia that should be afraid of us and our values. And I think that is what Putin is afraid of - he is afraid of Western values and that is why he is trying to kill hopes for a Western future in Ukraine, Georgia, and we cannot let him to do that. Should we be concerned about the possible escalation of the North Korean crisis, as it can divert attention, especially from the United States. Well, it is dominating the headlines and that is a very fragile situation. I am a bit concerned about the escalation of the rhetoric in both directions. I frankly wish that the president of the United States would play the part of some of his predecessors in being the mature, restraint leader when it comes to his rhetoric. In focus is the coalition, including China and even Russia, to put more pressure on the North Koreans to negotiate some kind of solution to the nuclear question. I think, in fact, if we put aside the rhetoric, the United States has been reasonably successful in getting the strongest UN sanctions ever adopted against North Korea and clearly getting China to put much more pressure by cutting some key strategic exports to North Korea and refraining from buying some other imports. So, we need to let that strategy of pressure work and not stumble into a military conflict because of a rhetorical excess. You were also urging sides in Ukraine to achieve some sort of agreement on a peacekeeping force in Eastern Ukraine. Isn’t Putin’s sudden support for such UN forces a kind of ruse to strengthen the status quo over the occupied territories, or do you see it as a real opportunity? I do not know whether it is a ruse or a serious proposal but we need to test Mr. Putin at the bargaining table, in this case even within United Nations Security Council. By seeing if we can draft a resolution that provides a robust mandate for a peacekeeping force that would actually achieve the goals of the Minsk agreement and end the violence, and ultimately see that all the weapons and illegal armed formations are withdrawn from Donbass and Ukrainian sovereignty is restored. Perhaps over several stages – there could be a period of transition in which there would be some kind of international administration in place with UN peacekeepers, and Ukraine placing its own troops at the international border at the end of this transition period. Right now, we do not know whether it is serious or not, so let’s keep a real peacekeeping force on the table and see whether the Russians accept it. Is the NATO apparatus, the alliance’s decision-making process and implementation of these decisions fast enough to meet modern threats? Should NATO be reformed to become more flexible, “faster”? In terms of decisions relating to capabilities and the enhanced forward presence, or bringing our military strategy doctrine up to date – I think the NATO system works pretty well. You don’t need summits to make these kind of decisions. And we are hoping, for example, that by next February the defense ministers of NATO will agree on changes to the military command structure. They are needed to fully equip the alliance for the potential of the full-scale conflict with Russia. Right now, each command structure was geared more towards Afghanistan type of operations. It was reduced in size back in 2010-2011 when the world was a safer place. But I think that there is a different area where NATO does need to accelerate its decision-making - that is how it conducts itself in a crisis. We must also think about hybrid warfare and the potential for ambiguous situations in which some unmarked soldiers, like little green men, suddenly appear, as well as cyber-attacks, which cannot be determined from which country they are coming from, and civil unrest being provoked perhaps by fifth columnists. All these things could create potential for aggression before you are fully aware of what is happening. NATO needs to speed up its decision-making and needs to do a good job on sharing intelligence about these kinds of warning signs much more quickly, so that we are not one, two or three days behind the events and unable to respond. So, this is the kind of a decision-making that does need to be accelerated. Does the Western world and NATO finally understand how to respond to propaganda and fake news assaults? We need to counter the kind of the day to day propaganda which aim to distort reality, whitewashing Russian crimes in Syria or in Ukraine, giving support to extremist political parties or separatist or nationalist movements. We also must improve our ability to conduct information warfare in an actual conflict situation. The Russians will use cyber-attacks, they will also use everything from SMS messages, the mailbox of our soldiers to more large-scale propaganda in the international news media. They will try to deceive our decisionmakers or at least create doubts, and create hesitation which will paralyze NATO from taking the necessary decisions in a timely way. I think NATO should give more resources to this Stratcom center of excellence in Riga and more countries should participate, they should link up with this new center in Helsinki of hybrid warfare, so that we develop more awareness and new strategies for meeting these very complex threats. They are not new, the Soviets used to use these techniques back in the 20s and 30s when mobilizing the international communism movements, even selling their strategic alliance with Hitler after 1939. But with the internet, with the cyber methodology of now, this sort of information can be weaponized on a much larger scale at very little cost. We look to experts like those from the center of excellence in Riga to help us think through and develop a strategy for countering it. The Western world seemed to be shocked by Russian efficiency in this field and still seems to be shocked. Was it really so unpredictable? Well, we should not be shocked. We have seen a very hostile attitude on part of President Putin, particularly if you read his 2007 speech at the Munich Security Conference and many of his statements since then. He sees Russia as being at war. He is fighting against Western values that can ultimately threaten Putin’s system in Russia. I think that is driving a lot of what we have seen. But I think we did not calculate that they would make a deliberate effort to interfere in American elections or to use stolen information combined with the spreading of extremist messaging on Facebook and Twitter. I think we did not have the imagination to believe that they would have such an ambitious strategy. We learned a lot of lessons. The US is still investigating some of this, although the president of United States is still in a bit of denial about this himself. But I think most politicians and experts in America takes it very seriously. And we have already learned to counter it. Russia had far less success in France and in Germany. Understanding this is the first step towards the solution.